It’s been a long time since I last read shojo manga. As a fan of the more moé and shonen series, I very rarely pick up shojo titles in my eight years of collecting manga. But some time ago, I had a girlfriend who was also into manga, and she (literally) forced me to take in series like Hot Gimmick, Marmalade Boy, and Fushigi Yuugi. Fortunately, the girl had good tastes in manga, so despite following outside the target demographic of these titles, I found myself enjoying them a lot. 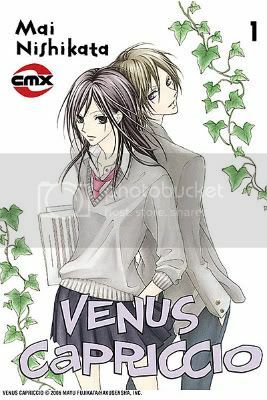 But again, that was many years ago, and I haven’t picked up a truly shojo title since then. So when CMX sent me a copy of Mai Nishikata’s Venus Capriccio to review for this site, I was worried that I might be a little rusty in being able to evaluate such a title. Much to my surprise, however, Capriccio was an enjoyable read. BFF’s since early grade school, Takami goes to Akira to vent after just getting turned down by a boy she likes. Having been the youngest in a family of three older brothers, Takami has grown to be quite the tomboy, and she’s afraid that she may not be “girly” enough to land the right guy. She compares herself to Akira, who is far more feminine then she has ever been despite the fact that he’s a boy two years younger than her. How did her best guy pal end up becoming a better girl than she is? No matter how much Takami may treat him as such, Akira is not her little sister. He’s a beautiful half-Japanese, half-European musical prodigy. Once Takami begins to notice how all the other girls swoon over Akira as he’s playing piano in a jazz club, she begins to reevaluate her relationship with her BFF. Could this be the boy she was meant to go out with this whole time? Right off the bat, I was reminded of the little characteristics of the shojo format that I have long forgot about, namely the little blurbs from the artist written with in each chapter. While she can be a little too modest at times, Nishikata’s little one-on-one with the reader provides an interesting commentary and insight into her creative process. While other artist may use up the blurb to talk about their favorite flavor of ice cream, she shows that she is dead focused on talking about the comic while occasionally making an off-topic interjection or silly sketch. It’s very well balanced and well written, and she won me over by ending her first little blurb with “Not that this has anything to do with anything, but here’s my cat!” and a cute drawing of her cat. Another very positive aspect of Nishikata’s series is that she doesn’t go too overboard with her character designs. While many shojo artists may take the setup of a feminine pretty boy to the extreme, this artist keeps herself in line. Akira is clearly a boy and Takami is clearly a girl, so the gender ambiguity doesn’t ruin that aspect of this volume. In fact, I’d say that some of her female characters look absolutely adorable, and would probably look fine in any of the moé and shonen series I’m used to reading. As far as the story goes, I’m no expert on shojo by any stretch of the imagination, but I have read enough to know that high school romantic dramas are a dime a dozen in the manga world. In order to stand out among the crowd, you need to have a really unique hook. Capriccio‘s main hook is evident right there in the series title as “a capriccio” is a term used in classical music to denote a certain tempo. The two protagonists met at a piano school and spend a lot of the time working together in playing the instrument. Musical terminology and concepts add a very sophisticated element to the generally goofy rom-com, and readers with a background in musical theory will immediately enjoy the two’s comedic bickering over it. And the subject of gender ambiguity can also be a great plot device if done correctly. While the character designs do not necessary reflect the feeling of androgyny that Kishikata is trying to convey, Takami’s masculinity and Akira’s femininity are the source of many of the comic’s humorous moments. And surprisingly, Nishikata is able to pull off this gimmick well enough to come off as very charming and funny. It might not be the most original story to be drawn in the manga, but I did get a kick over seeing Takami entering a “Prince and Princess” talent competition as the prince in order to perform with another female. But unfortunately, Nishikata just never gets too deep into these hooks. The heart of Capriccio is in the clichéd drama and petty personal conflicts of high school romance, which is exactly the kind of mediocrity that keeps me away from the genre in the first place. The series doesn’t do enough to make it stand out among the rest. It’s still cute and enjoyable, but it really could have been so much better if they had just done more with the music or gender bending aspects. The Good: Enjoyable plot, well written artist notes, pretty character designs, and artist doesn’t go overboard with the concept of androgyny. The Bad: Doesn’t go far enough in it’s unique attributes to really stand out among typical shojo romance. Final Verdict: While it might not be a particularly groundbreaking entry into the tired-and-true genre, Venus Capriccio comes with enough quirk and charm from its artist to make it a completely enjoyable shojo romance manga. This entry was posted on Wednesday, April 22nd, 2009 at 8:20 pm by Scott	.